Something magic occurs when peanut butter and chocolate combine! It’s a palate pleasing pairing that I, for one, cannot get enough of. 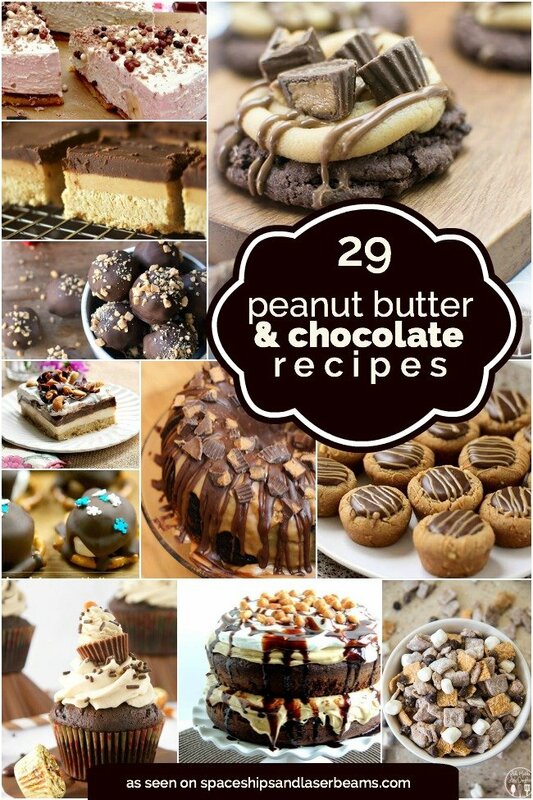 I hunted down 29 of the most delectable peanut butter and chocolate dessert recipes to share with you today. Because let’s face it, the world can never have enough peanut butter + chocolate options! Whether you are looking for a homemade peanut butter cup cookie recipe or a new way to prepare chocolate peanut butter mousse cake, I’ve got you covered! Indulge in chocolate without cheating on your diet with this No Guilt Brownie Recipe. You do not want to miss out on this delicious Chocolate Snickers Mug Cake. 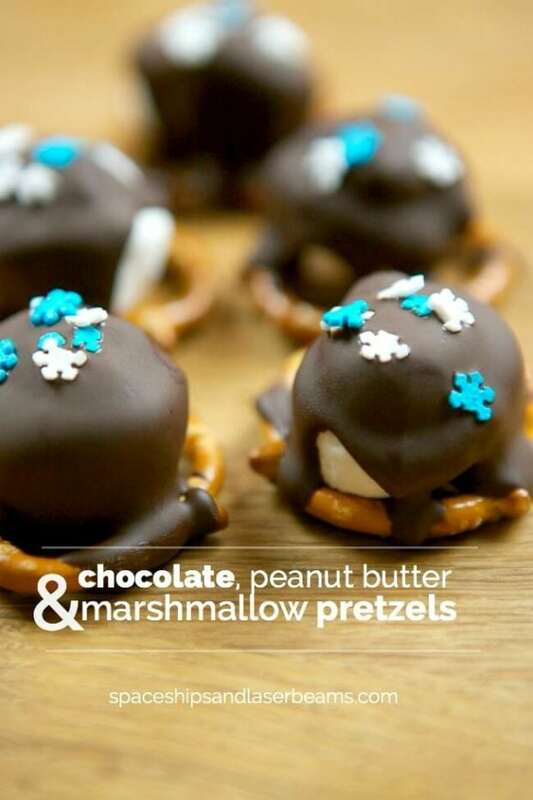 Check out all these delicious desserts made with Reese’s! 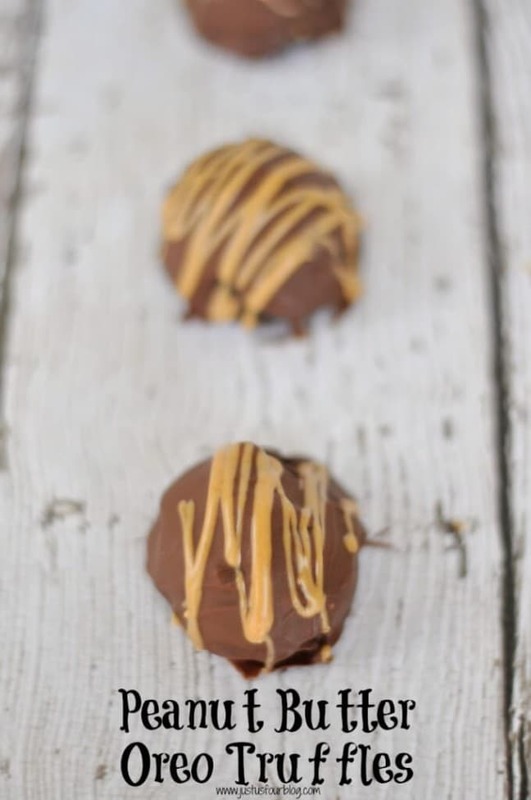 These Homemade Turtle Chocolates are another sweet to love. 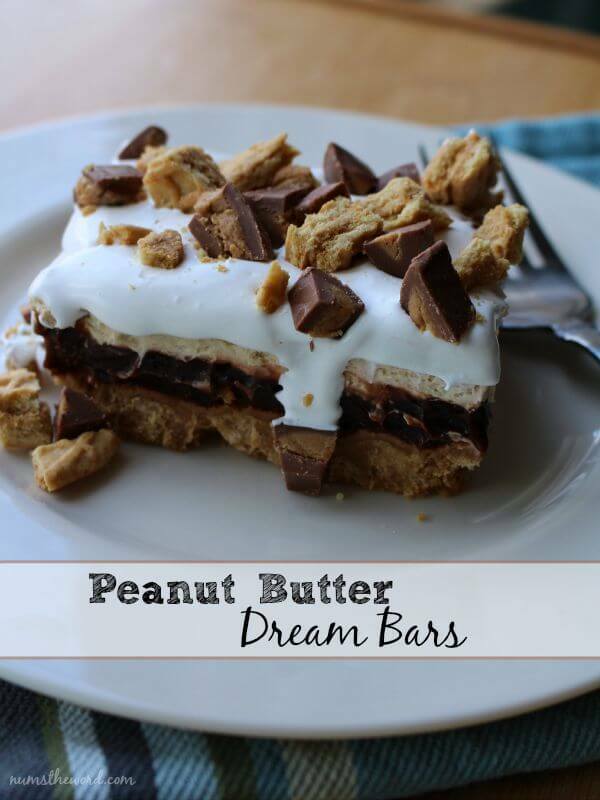 When you have a house full of friends and family, these Peanut Butter Dream Bars are the perfect dessert to serve up. I mean, look at these bars! I could reach through the screen and start easting. 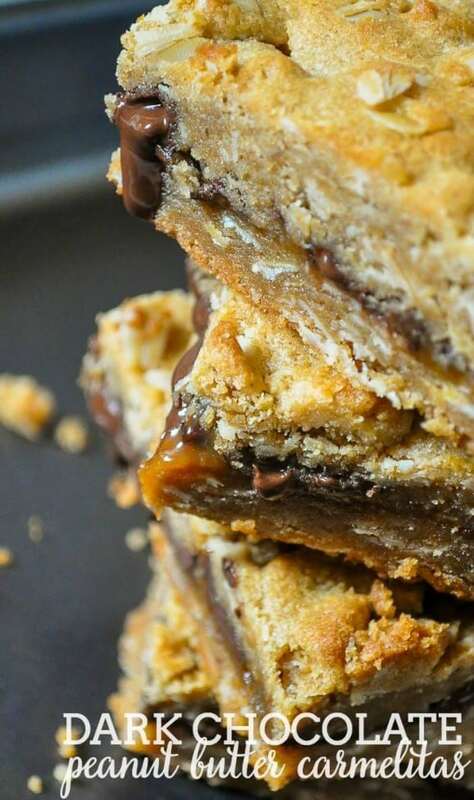 These dessert bars are dreamy and creamy, and filled with chocolate peanut butter goodness. They are super easy to make for a crowd and taste amazing. 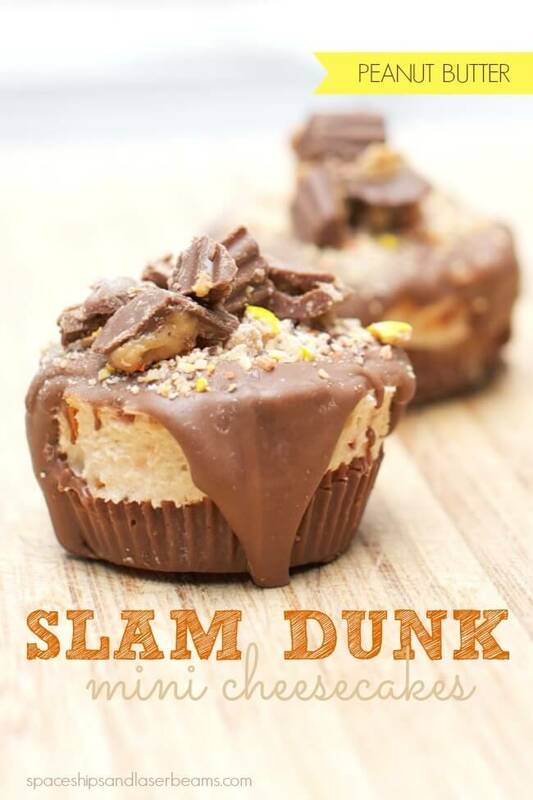 Oh so easy to make on a dime, these Reese’s Slam Dunk No Bake Mini Cheesecakes are the ultimate treat for last minute parties or potlucks. 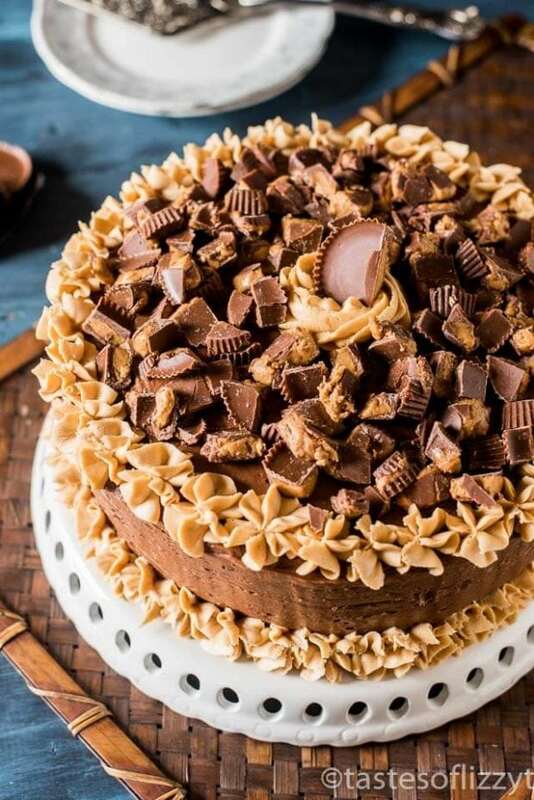 A whole Reese’s Peanut Butter Cup gets topped with a luscious peanut butter cheesecake filling laced with crushed Reese Pieces, melted milk chocolate, and chopped chocolate peanut butter candies. You will have so much fun making (and eating) these two-bite Chocolate, Peanut Butter, and Marshmallow Pretzels. Layer marshmallows on top of pretzels then spoon a dollop of melted peanut butter chips right on top. Coat with melted chocolate and sprinkle with some festive sprinkles, crushed candies, or chopped nuts! These tasty little treats are sure to be a hit with your family and friends. Sweet caramel, creamy peanut butter, and rich dark chocolate make a serious power combination. Three of our favorite ingredients come together to make these out-of-this-world Dark Chocolate Peanut Butter Carmelitas. These dessert bars are so incredibly decadent that you won’t want to share a single bite. I don’t think it gets much better than a warm dessert bar dripping with chocolate and caramel! 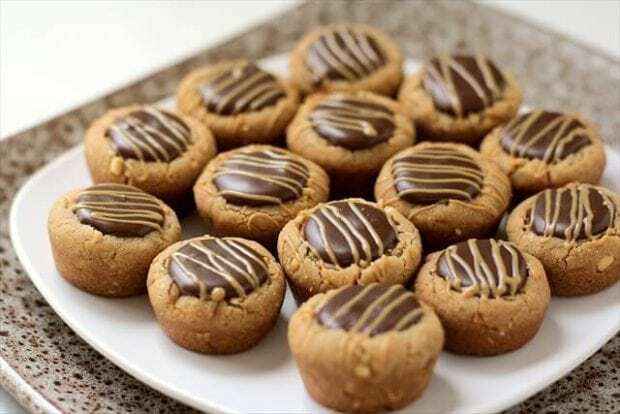 These amazingly fun Reese’s peanut butter cookie bites make a delicious bite-sized treat for your next party or gathering. You won’t be able to have just one. Create a delicious sugar cookie crust and fill it with the chocolate peanut butter cup goodness that we all know and love. The cookie exterior is shaped into a perfect little cup using a mini muffin tray. Genius! 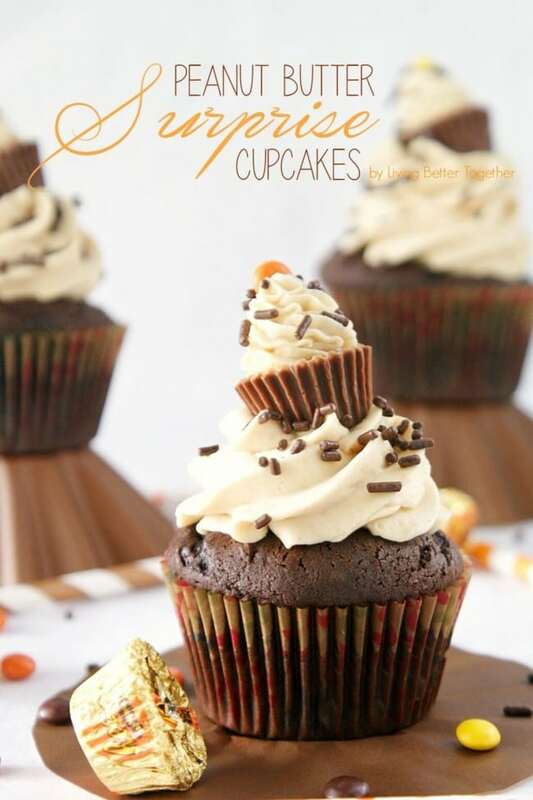 Celebrate your next birthday, anniversary, graduation, or celebration in style with this magnificent Peanut Butter Chocolate Surprise Cupcakes. Moist dark chocolate cupcakes are filled with a sweet Reese’s Pieces surprise in the middle, then topped with the silkiest peanut butter buttercream frosting. Did we mention the Reese’s peanut butter cup plopped right on top? Awesome, right? S’Mores Muddy Buddies are the perfect snack for after school, while watching a family movie, or whenever the craving for something sweet strikes! 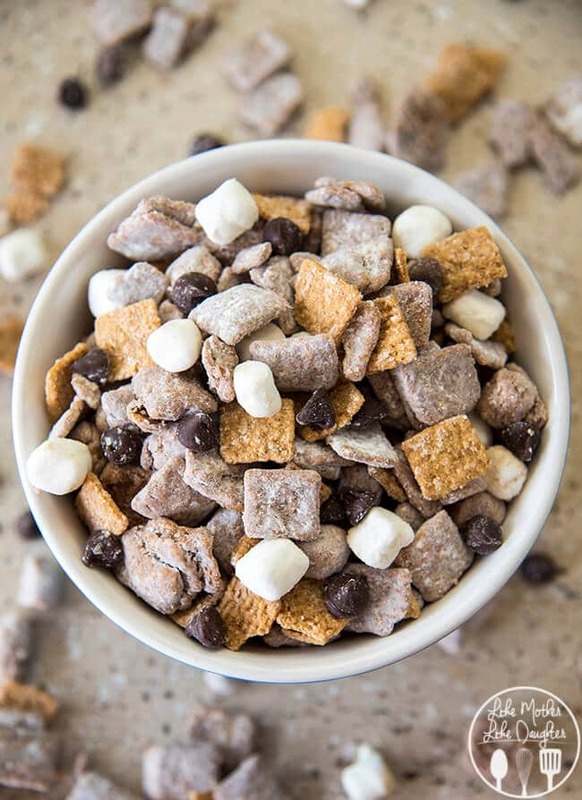 The all-time favorite combination of sweet chocolate and creamy peanut butter is mixed into muddy buddies with marshmallows and Golden Grahams. With only 6 easy ingredients you can make this amazing treat right at home. Your family will gobble up these Peanut Butter Cup Cookies in no time, so make sure you hide a few somewhere safe for yourself. The base for the cookies starts with a devil’s food cake mix. 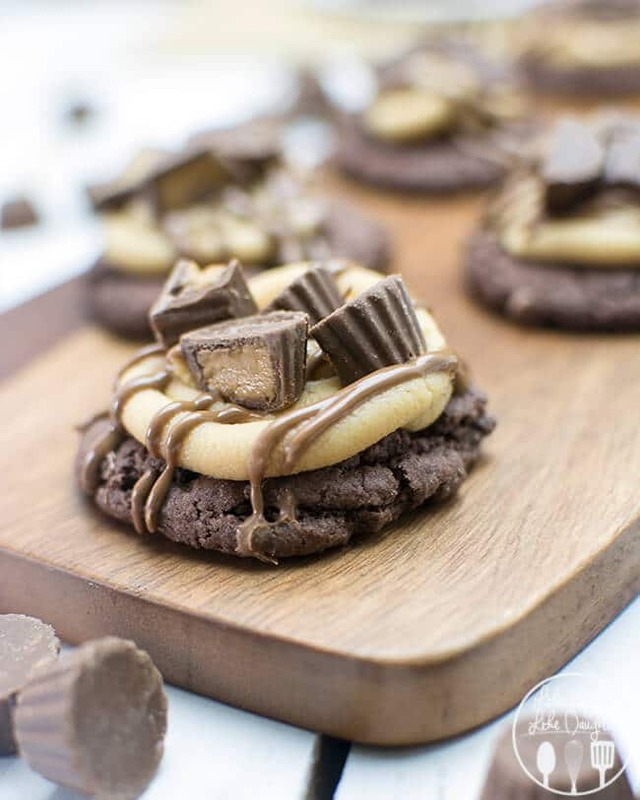 The soft and chewy cookies get topped with a simple homemade peanut butter buttercream frosting, drizzled with peanut butter chocolate ganache, and sprinkled with chopped up mini peanut butter cups. Dessert dips are a holiday and special occasion for good reason. They are easy to serve and people can dish out however much they want onto their plates. This Peanut Butter Cup S’Mores Dip tony marshmallows, chocolate peanut butter cups, and creamy swirls of peanut butter tastes terrific. Serve with some graham crackers or apple slices for a delicious party treat. Decadent and delicious, this Triple Chocolate Peanut Butter Mousse Cake is chocolate cake perfection. 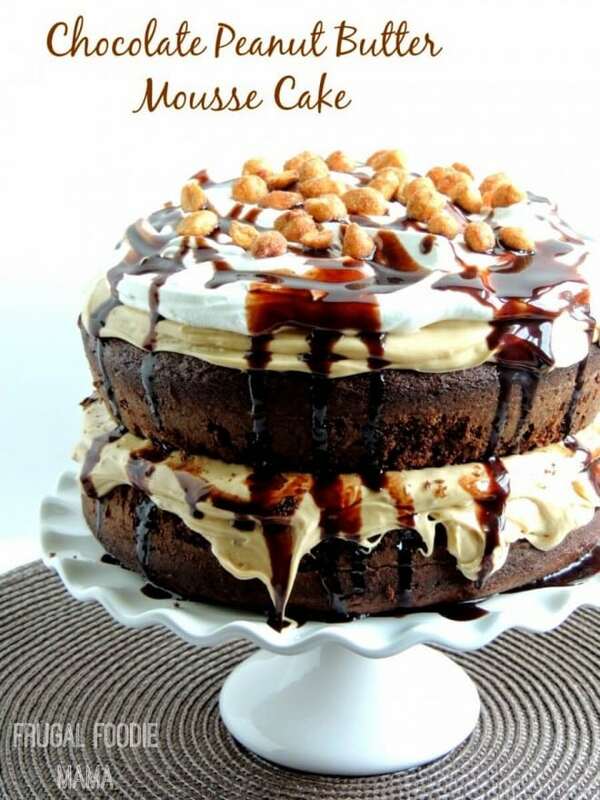 How can you go wrong with moist chocolatey cake layers frosted with a rich and creamy peanut butter mousse, then topped with your favorite whipped topping, loads of chocolate syrup, and honey roasted peanuts? If you have any chocolate peanut butter lovers in your life, you have got to make this for them. This cake is perfect for the Reese’s lovers in your life. Layers of moist chocolate cake are layered with delicious peanut butter frosting and a rich chocolate buttercream. Small pieces of Reese’s peanut butter cups are sprinkled all over the top with a full peanut butter cup right in the middle. This delectable cake is perfect with a big scoop of chocolate or vanilla ice cream. This Loaded No-Churn Peanut Butter Ice Cream is the ice cream of your dreams. 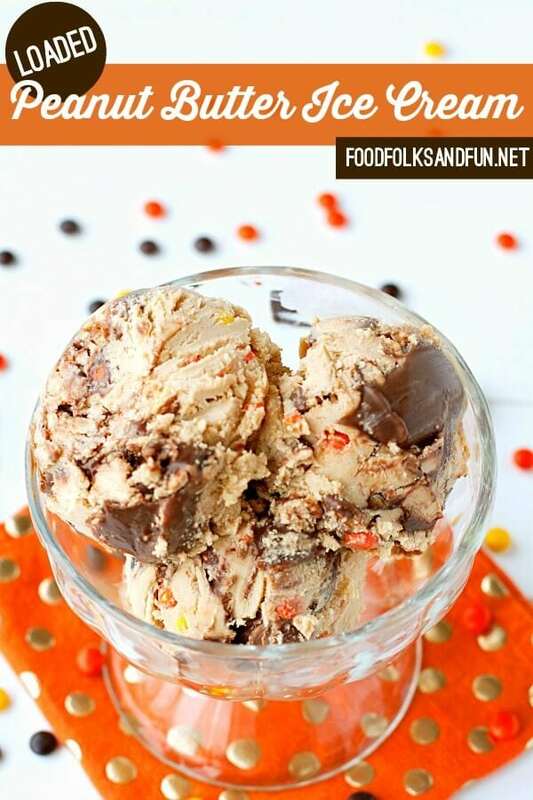 It’s loaded up with hot fudge sauce, creamy swirls of peanut butter, Reese’s Pieces, and chunks of peanut butter cups. Let your kids help you stir up the ice cream with all the mix ins. This is a great recipe that comes together in a snap without a machine. When you are piling your family into a car for a road trip, easy hand-held snacks are a must have. 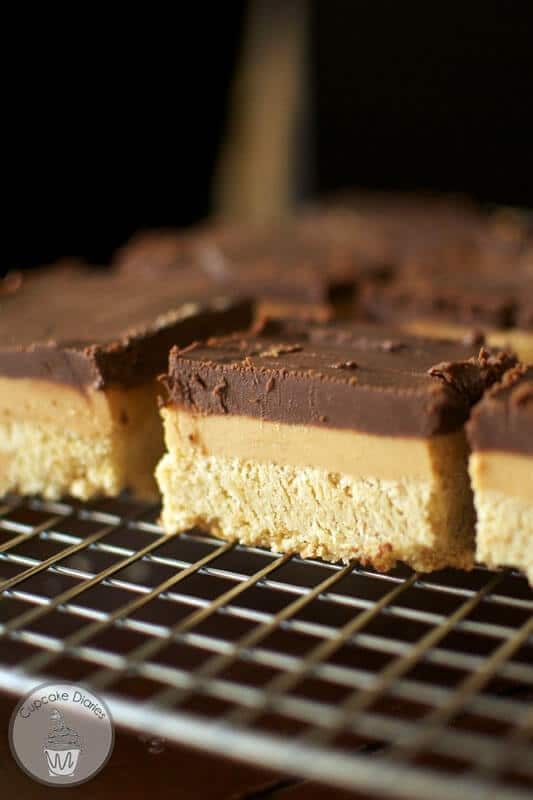 These Peanut Butter Bliss Bars are super easy to make and taste just like a giant peanut butter cup! Some graham cracker crumbs, powdered sugar, peanut butter, and chocolate chips will create a delicious, sweet, and fun treat the whole family can enjoy on the go. Chocolate and peanut butter are one of those combinations you just can’t resist. Add some Oreos to the mix and you have the ultimate sweet treat. These Peanut Butter Oreo Truffles are decadent bite-sized treats that are easy to put out on a dessert table or potluck feast. One of the best things about Oreo truffles are that they are so, so easy to make! These little cuties will take you back to your childhood and your mom’s homemade cookies. 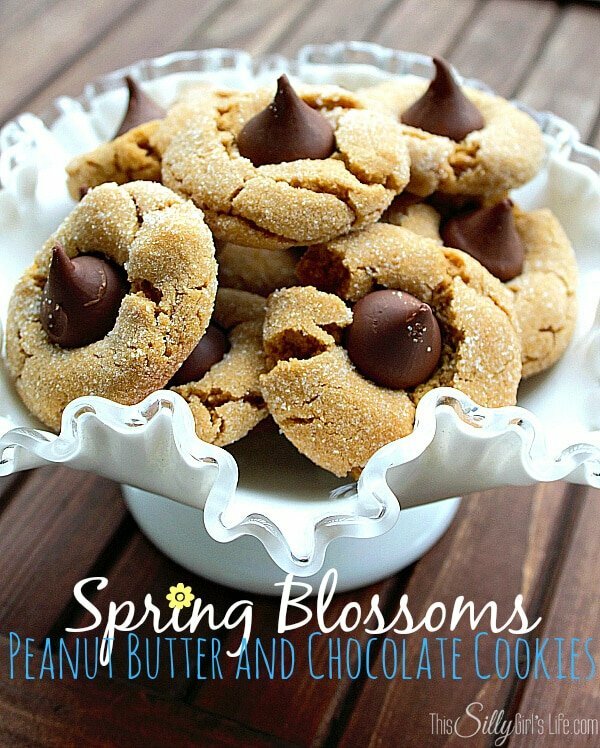 Spring Blossoms Peanut Butter and Chocolate Cookies are chewy peanut butter cookies with a cute little Hershey’s kiss pressed into the middle. This is a classic recipe that everyone has to have in their recipe book. They are definitely a go-to! 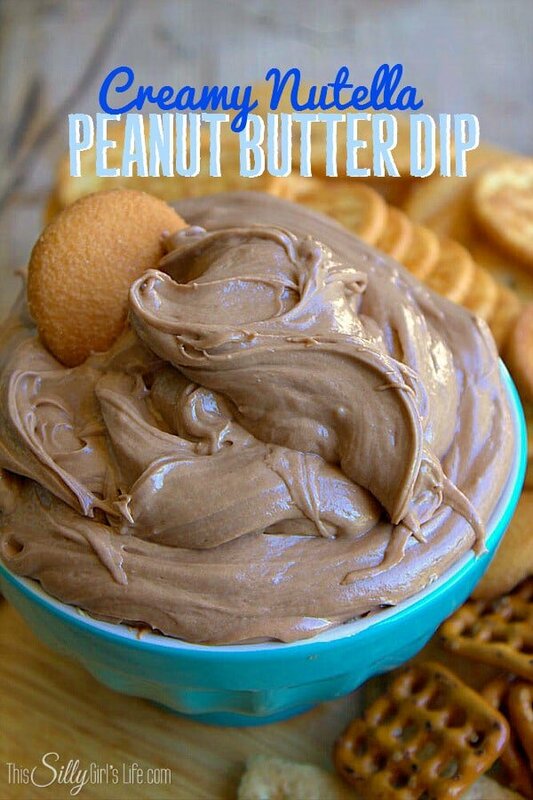 Creamy Nutella Peanut Butter Dip is a sinfully sweet dip that is sure to be a crowd pleaser at any party you bring it to. Nutella, peanut butter, marshmallow crème, and cream cheese are combined to make this yummy treat. You can serve this dip with pretzels for a sweet and salty snack, or as a fruit dip with strawberries, apple slices, or even banana slice! This recipe has two parts that are equally delicious. A sweet and chewy peanut butter cookie base is filled to the brim with a rich and chocolatey fudge filling. Peanut Butter Fudge Cups combine two favorite flavors into one delicious treat, and are super easy to make. They are a great treat to bring to family dinners or cookie exchanges around the holidays. When it comes to comfort food dessert pies, chocolate chip cookies, and peanut butter anything rank high on our lists. When you combine all three of those favorites you have the ultimate, bomb-digity, comfort food dessert. 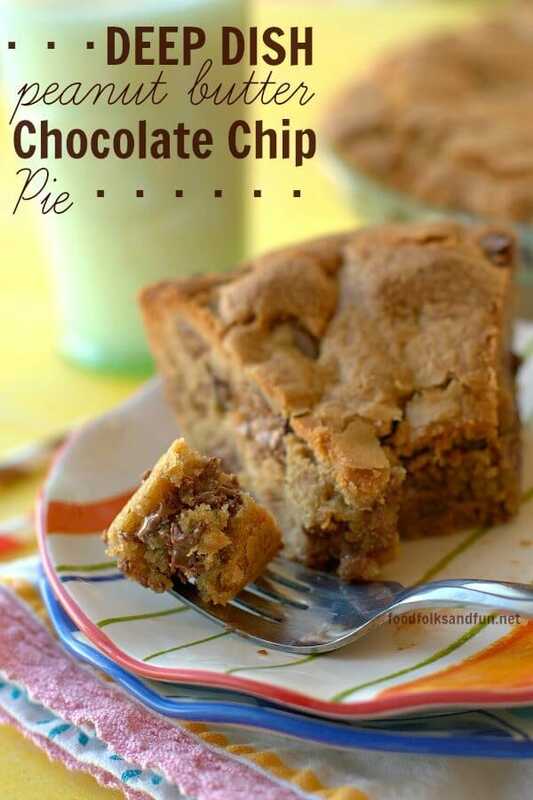 This Deep Dish Peanut Butter Chocolate Chip Pie is ooey, gooey, and totally delicious. 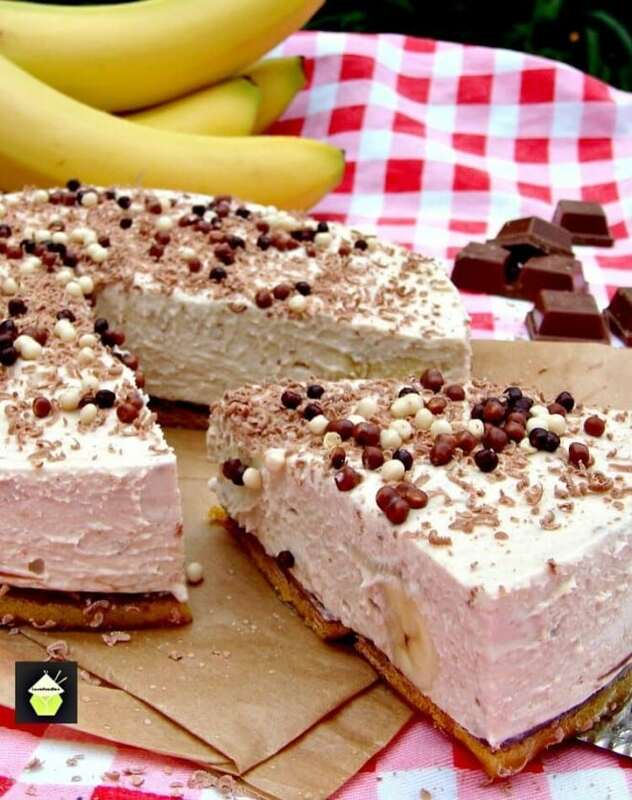 A tall glass of milk is a must with this decadent dessert! Raise your hand if you are a cookie dough junkie! It is hard to beat these chocolate topped cookie dough bites. 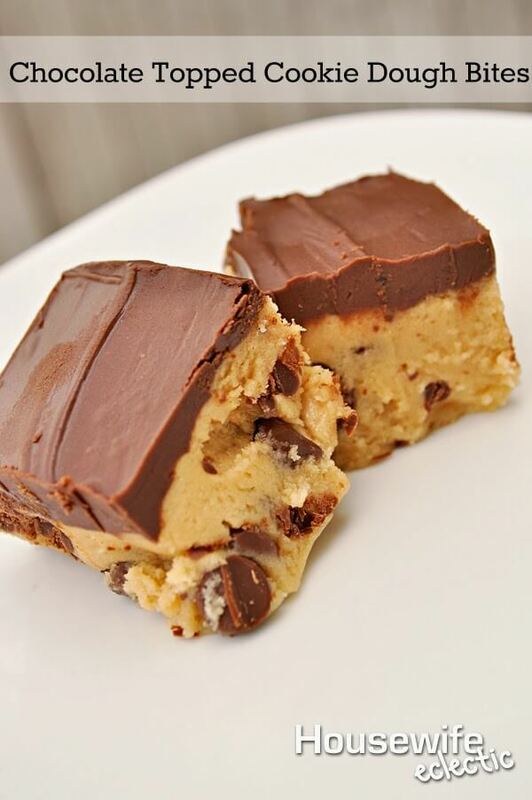 Sweet and silky edible chocolate chip cookie dough is topped with a smooth peanut butter chocolate layer, then cut into the perfect, bite-sized bars. They take no time at all to make, then you just pop them in the fridge until you are ready to serve dessert. You only need three ingredients to make this decadent chocolate dip that will be the hit of any dessert tasting. Peanut Butter Chocolate Fondue is so creamy and chocked full of rich peanut butter flavor. 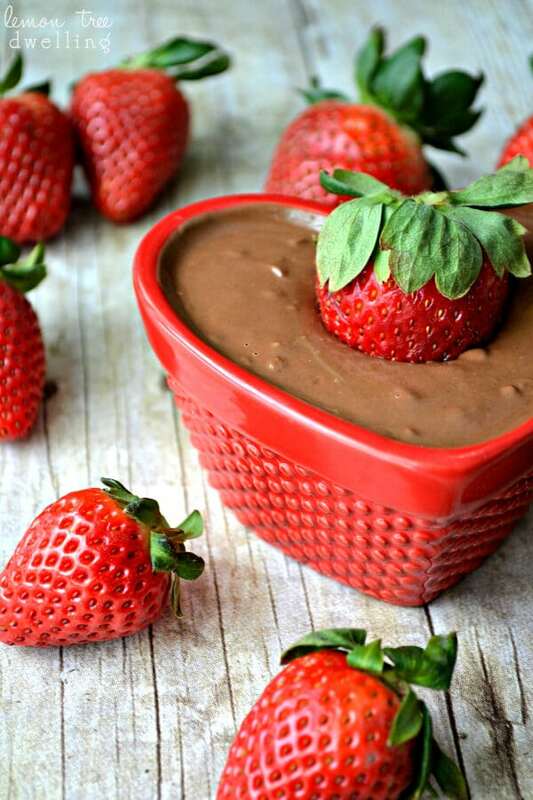 Strawberries, bananas, or other favorite fruits make the perfect dippers and will have you begging for more. 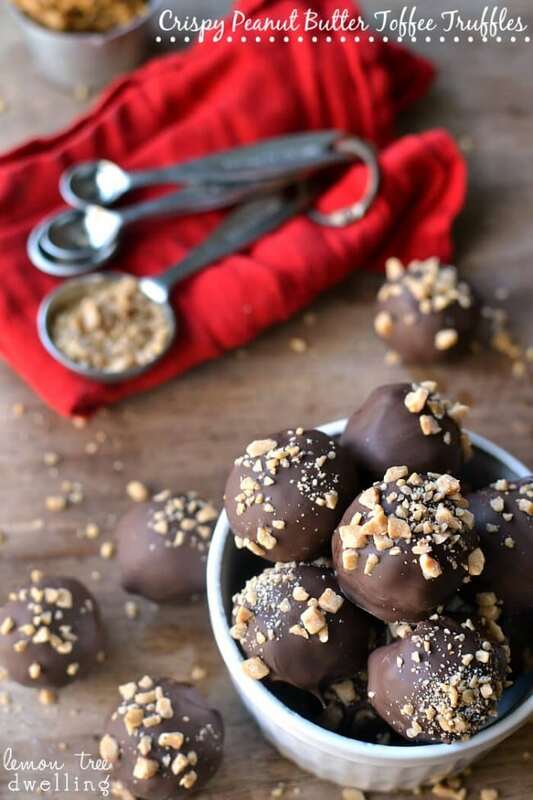 Crispy Peanut Butter Toffee Truffles are a perfect addition to your holiday treats or year round baking line up. These light, crispy, melt-in-your-mouth peanut butter toffee truffles are coated in rich milk chocolate and topped with crushed toffee bits! 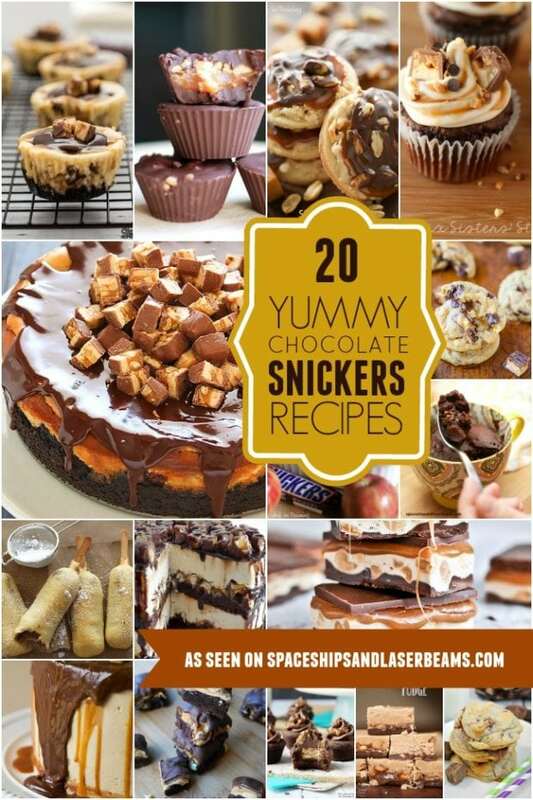 Plus they are a no-bake treat, which are always winning recipes in our books! This is seriously one of the best peanut butter cookie recipes out there. Peanut Butter Chocolate Chip Pudding Cupcakes are soft and chewy and of course the chocolate makes them even better. 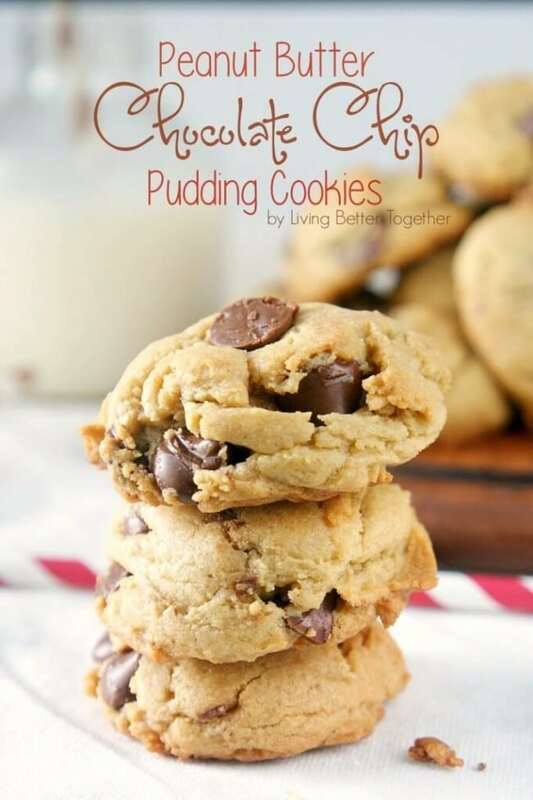 The pudding adds flavor and helps keep the cookies perfectly soft for as long as possible. Peanut butter and chocolate is a serious match made in heaven. Rich and decadent, you are going to want a tall glass of milk with a slice of this amazing Chocolate Peanut Butter Bundt Cake. 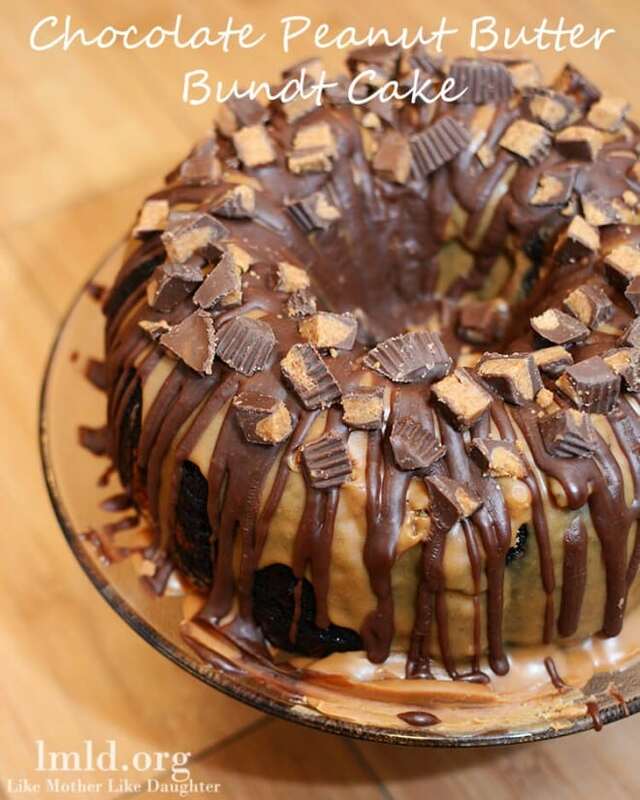 Chocolate cake and peanut butter cake are swirled together in a Bundt pan and baked, then drizzled with peanut butter ganache, chocolate ganache, and some mini Reese’s peanut butter cups. This cake couldn’t be better. Our favorite desserts are ones that are incredibly easy to make, but look mighty impressive to guests. This Peanut Butter Banana Cheesecake is just that. A chocolate chip cookie crust with a smooth chocolate layer is topped with a creamy filling loaded with sliced banana, maltesers, and peanut butter! Served nice and chilled, it’s the most delicious dessert for a warm, summer day. Million Dollar Bars are the peanut butter version of Scotharoos! Rice Krispie cereal is flavored with melted peanut butter, light corn syrup, and a touch of vanilla, then topped with a nice thick layer of melted chocolate. Everyone will love these chewy, delicious, and easy to make treats. When you make this cake be prepared to give out the recipe, it’s really that good. Chocolate and coffee are combined to give the homemade cake a spectacular mocha flavor and the texture is so moist and soft. 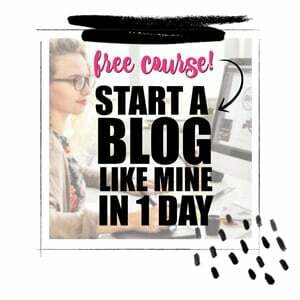 To make it even more irresistible add a thick layer of decadent peanut butter frosting on top. Homemade Chocolate Cake with Peanut Butter icing is easy to make for a big party, too! 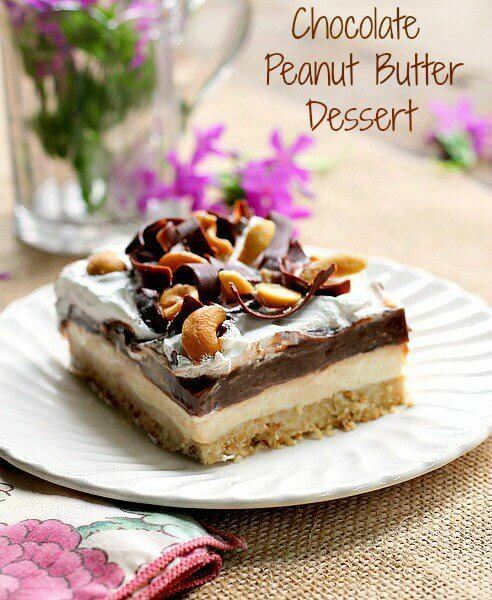 This little treat is a chocolate and peanut butter lovers delight. The peanut butter layer is made with smooth cream cheese and the chocolate layer is made with luscious chocolate pudding. The base of the dessert is buttery and laced with cashews, all topped with light whipped topping! This Chocolate Peanut Butter Dessert is cool and creamy right down to the last bite. 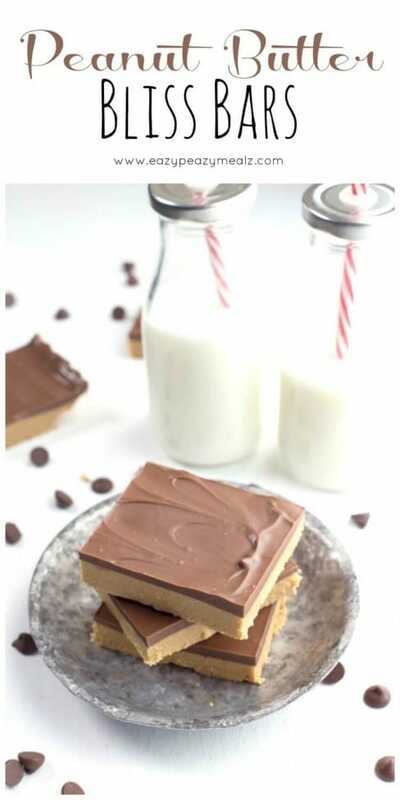 These Chocolate Peanut Butter Cookie Bars are loaded with all kinds of peanut buttery goodness with a fabulous graham cracker cookie dough layer and a crunchy chocolate layer on top. Oh man, these things are good! They are the perfect treat to make with your kids for some quality family time, or to whip up quick for parties and bake sales. No matter the occasion, this recipe is necessary to have on hand. 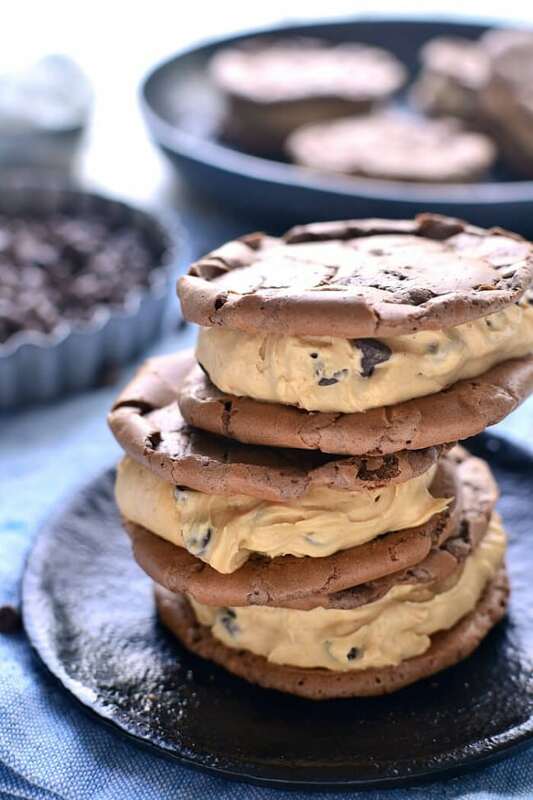 Peanut Butter Chocolate Sandwich Cookies are the perfect pairing of two of our favorite, most decadent flavors. The chocolate peanut butter cookies will remind you of soft and chewy brownies, and the peanut butter frosting in between is beyond words. Together they make one of the dreamiest cookies you will ever eat. Create your own delicious peanut butter chocolate recipe with these Amazon products gathered by the crew at Spaceships and Laser Beams.